Letting this yeast waffle dough rest overnight gives the dough a chance to develop better. Start it the night before and enjoy fresh waffles in the morning. With a crunchy melted sugar crust and soft on the inside these belgian waffles are one of the most popular items I make! Over the past few years Belgian Liege waffle trucks and restaurants have showed up everywhere. My Dad was obsessed with them and asked me to figure out how to make them! It’s so rare that he really LOVES a food item enough to request it that I got RIGHT on it! I scoured the internet and found quite a few recipes. It seems like there were two camps, the traditional overnight recipe (developing flavor and texture) and the quicker few hour version. You guys KNOW I’m all about getting the best possible flavor and not cutting corners when it comes to… well anything, but esp GOOD food. So I went for the authentic overnight version and WOW sooooo good. I’m all about preping the night before for a big meal anyway, then the day of everything is ready to go and serve to my guests! So the time it takes doesn’t bother me at all. I’ve TRIED quicker versions and they are OKAY, but still lacking that quality that makes these waffles amazing. Just take me to the Belgian Waffle Recipe already! 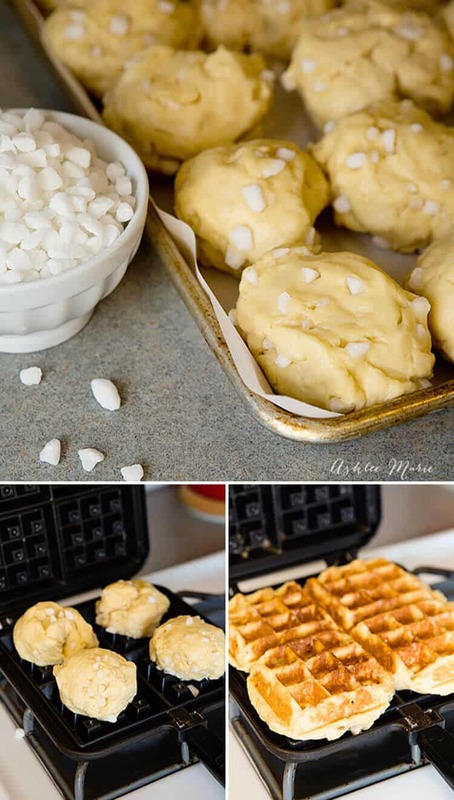 If you’d rather skip the tips and tricks and tools to make these Liege Waffles, and more Belgium waffle recipe ideas – and get straight to this delicious Liege waffle recipe – simply scroll to the bottom of the page where you can find the printable recipe card. Sugar burns at 375, so you want to cook your waffles at 365-370 degrees (you don’t want those big sugar chunks to start burning, trust me, nasty to eat and nasty to clean). Regular home waffle irons heat anywhere from 420-550, which is a problem. So to make what I had work what I did was heat it up, put the dough in for 1 min then unplug the machine for 3 mins. Depending on how hot your machine gets you might have to play with the time a bit (make an extra large batch the first time so you have extra dough to play with). The professional liege waffle irons are cast iron, weigh over 20 pounds and cook at exactly 365-370 degrees. But I DOUBT any of you have one at home, I don’t. So being annoyed with my regular electric waffle iron I bought this stove top waffle iron, to see if I could control the temperature better on the stove top. Stove top temperate range from 200 – 500, so I went just above the middle, trying to achieve 360. I found mine cooked best 1 1/2 min on the first side (where the side was already hot) and then 2 1/2 on the other side (started cooler). OR I would put the dough in and immediately flip, cook 2 mins, flip again and cook another 2 mins. BEST purchase EVER, and it made a HUGE difference in my waffles. 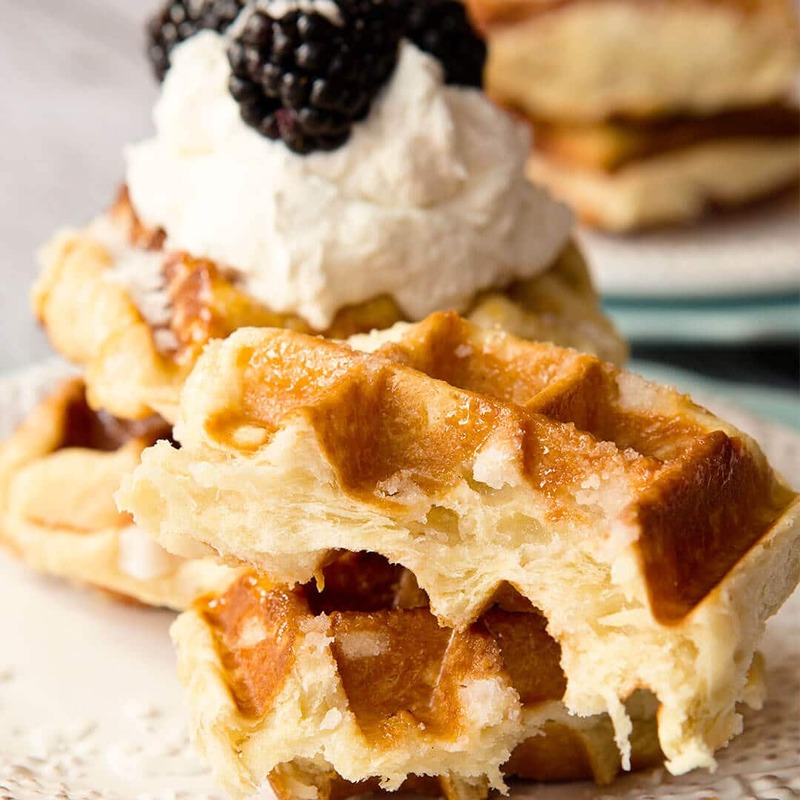 If you love this liege waffle recipe as much as I do, please write a 5 star review and be sure to share on Facebook and Pinterest! If you want to stay updated on new recipes sign up for my monthly newsletter and join my Facebook Group! 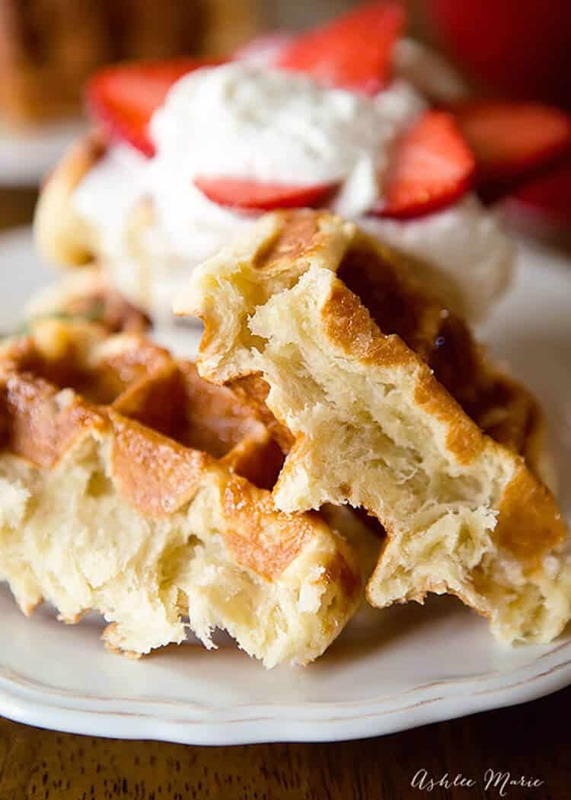 If you love this Belgian Waffle recipe you’ll love these other Liege Waffle recipes! Oh My goodness! Why must you do this to me?? Ashlee, where do you buy your sugar, are there any local shops. I am totally pinning this, you know I am going to have to make them! YES! I get mine on amazon simply because I can get 5 lbs at once. But Orson Gygi’s carries it, and I’ve heard that some Ikea’s does to, but I haven’t been down in awhile to see if that’s true. I have some in my freezer RIGHT NOW! come on by and I’ll cook some up for you! Pirate-O’s in Draper carries Belgium pearl sugar too. You can also buy the sugar at Orson Gygi which is where I found mine. yup they sell it there too! Wow! This looks really good :)! 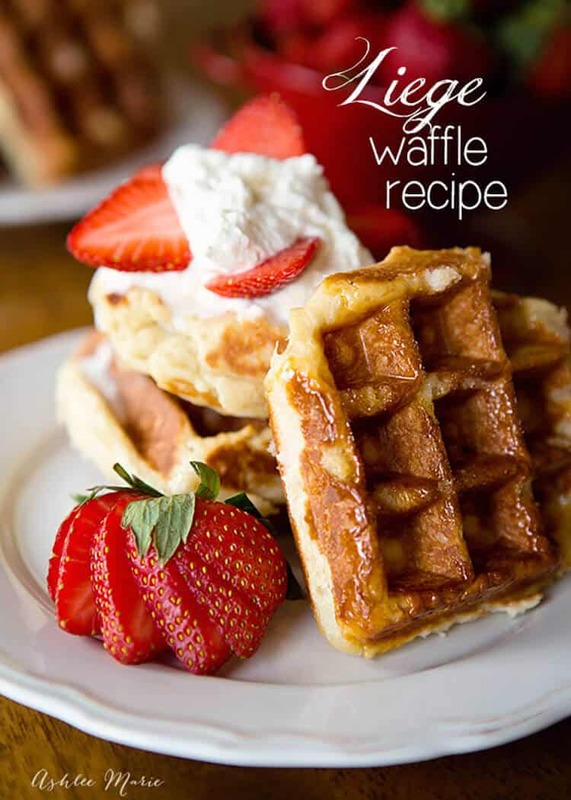 I’m always looking for waffles recipes too since my family loves them! I might have to stop at ikea this weekend to see if they have that sugar! Pinning for later! Yumm! Don’t waste your time at IKEA Karina – Amazon is seriously your best bet. Trust me, I’ve done the search. Ha! good to know :)! I will have to either go to amazon or Gygi’s! Don’t forget to let me know when you try them out! these are so so SOOOOOO good, Gygi’s has them for SURE, but Amazon is the best price, the small containers, one box is 1 1/2 cups so perfect for a batch, but as I plan on making them all the time I ordered a 5 lbs bag! If we lived closer I’d say come on buy and borrow a 1 1/2 C! Oh divine. You are so lovely to share! glad you liked them! You never did say if you thought the fast version was as good? I have been waiting for this recipe all my life!! Ever since going to Bruges for the first time Ive been needing this. Thanks!! my dad went for the first time and IMMEDIATELY called me to tell me I had to figure out how to make them at home! I’ve made them for him twice now! I’ve wanted to try making these forever…Love liege waffles! the first time I made them did take some trial and error, but now it goes really fast! They are oh so amazing! I made these a couple times and finally got it right (using your recipe!) Just want to say thank you… also, curious, do you find the yeast taste a bit overwhelming? I actually didnt add exactly as much as you suggested. Maybe about 3/4 of your amount. Any tips on how to lower that yeast taste a bit? Add more honey? Brown sugar? Other than that.. they were perfect. Your instructions were the most helpful as you even include how much time to beat them and let them rise. What kind of yeast are you using? if you use a fast rising yeast it will be too strong, try a regular yeast if that’s the case. 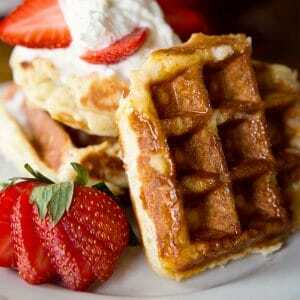 have you had other liege waffles that your trying to match the flavor to? 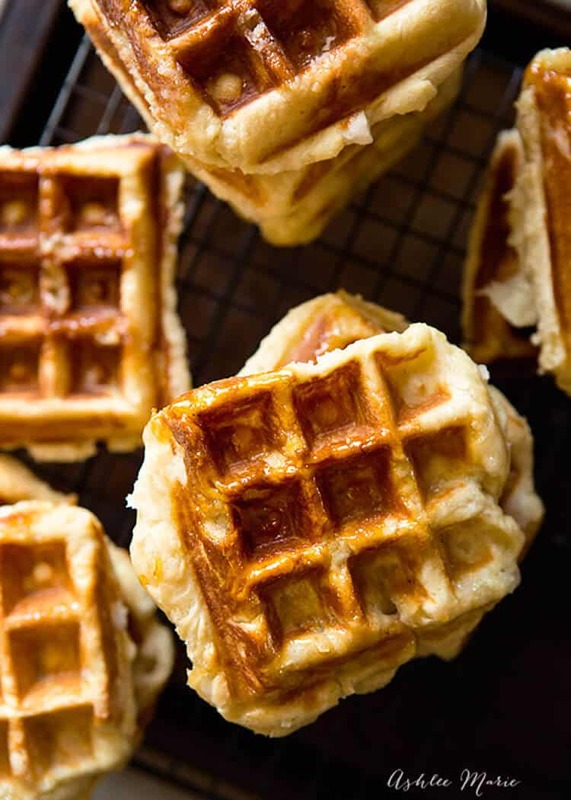 These are yeast based waffles and the flavor is strengthened by the rising times, but some recipes have optional cinnamon, you can try that too. What gorgeous waffles! I could have this every single morning! 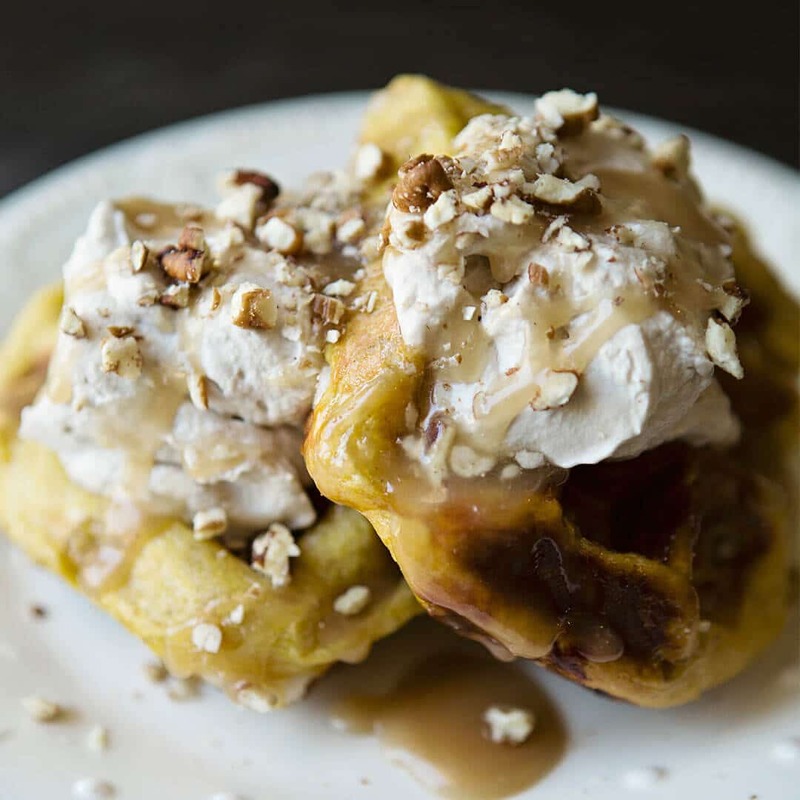 I tried this recipe for the first time last week and the waffles were incredible! I can’t wait to make them again! Should I freeze the dough balls before or after letting them rise 90 mins that last time? These turned out AMAZING!! Made them Christmas morning! Thankfully I had read the recipe over and over before taking the plunge. Ordered my pearl sugar (and I’m SO glad you specified Belgian and not Swedish)! They were SO yummy! Tons of work, but worth it once or twice a year. Doubled my batch, so I should be set for a while. How long did you say the dough is good for frozen? Also do you have any tips on cleaning the waffle iron – with all of the sugar, that was a beast! YAY! I’m so glad you loved them. For cleaning I tried to do it while it was still warmish the first time, and the second time I let it dry all the way then tried to clean it, either way it was tough, warm damp rag and qtips. With my stove top waffle makers that I use now i just soak them then re-season, probably not the best, but super easy! They are good frozen for 4 months at least, never tried to go longer. and it goes faster and gets easier every time. now i make them once a month! I first had Liege waffles in Belgium then found them at Northstar ski resort. They need no embellishment, imho, and are only worth eating piping hot almost burning your fingers. Yum! I have read much about them and decided they wouldn’t be possible for me to make with even a borrowed waffle maker. After these clear instructions I’m toddling over to my Amazon Prime account to order some of the Belgian sugar which is key. BTW, Liege waffles are my second fav food after freshly-squeezed orange juice. Thanks! Thanks for the recipe. I don’t have a dough hook with my stand mixer, can i use either the paddle or the stiff whisk instead? I wouldn’t use the whisks, it will probably break them, the paddle MIGHT work, it’s an incredibly thick dough, I know my girlfriend who made a single batch with her kitchen aid said it almost burned it out, but my bosch handles a double batch easily. I think it depends on what model of stand mixer you have, the higher end kitchen aid would probably be okay. I´m writting from Mexico City we don´t have bread flour here, can I use all purpose flour instead?? you can make it with regular flour, it won’t be quite the same, but it will still be pretty darn tasty! What kind of butter are you using? Salted or non salted? I’m making 6 batches for my French Club kids and I don’t want to ruin all my batches! We manufacture Liege waffle dough for wholesale and you’re right on about the waffle iron being critical. We searched and searched for an affordable household waffle iron that not only cooks the dough properly, but also gets a close to authentic shape (oval). The best we found is from Hamilton Beach, Model 26009, and it’s sold on Amazon for only $25. If you set it to the lowest temp setting, it gets to about 350F which is nearly perfect. 3 minutes cook time. 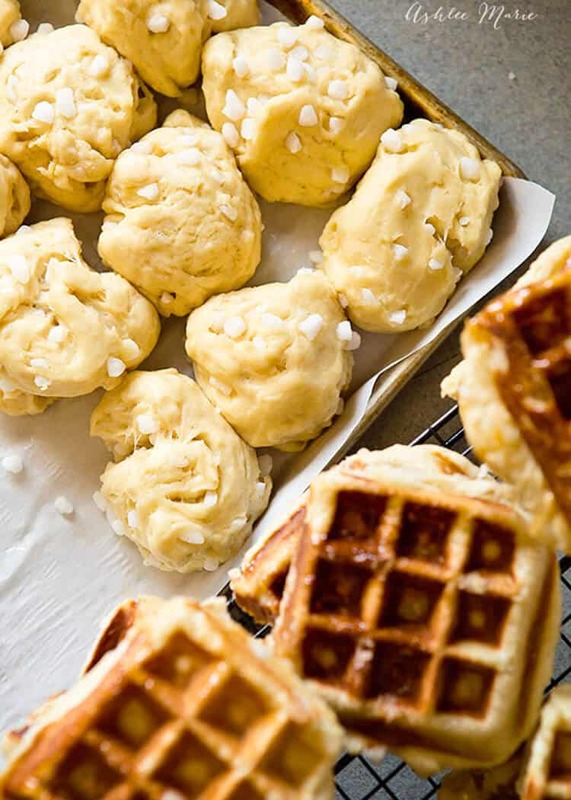 If you use a 3-4oz dough ball, you’ll get a close to authentic shape with this waffle iron. Remember to stretch the dough into an oval shape before pressing it b/c it gives the waffle a slightly lighter texture. We recommend it to our smaller customers who don’t want to invest in a $1k commercial waffle iron. thank you so much! that’s great advice and good to know! Next time my waffle iron breaks I’ll try this one out! Let me start off by saying thank you so much for this recipe. It’s exactly like the place where I was spending a fortune on buying liege waffles. I wanted to let you know that I cheated and pulled a dough all out at the 2 hour mark of the 4 hour rising and put some pearl sugar on it and cooked it in my waffle maker it came out fluffier and tasted just as good as the rest of the waffles that I made according to the recipe. I now have made a entire batch stopping at the two hour mark pouring pearl sugar in and mixing it and cooking and it came out great. Thank you again for all this great info. These look delicious! Any suggestion for dairy free conversion? i have no experience with dairy free. If it’s something that your used to doing I’d go with whatever usually works in baking/batters for you. a nut milk? or soy milk maybe? if you usually change the amt I’d do that too. Sorry I don’t have any experience in this area. These were perfect! I made these for the whole family for Christmas and everyone raved. As a matter of fact they’ve already requested I make them every Christmas. I had tried a different recipe previously from a different source and yours was far superior! The extra steps are totally worth it. Thanks for the excellent recipe. I’m SOOO glad to hear it! I am glad I’m not the only one in LOVE with this recipe, it’s our Christmas morning tradition too! I really want to try your recipe, but I saw the other comments about not using an instant yeast. Sadly, I just bought myself a 2 pound bag of instant yeast…do you think if I cut the rising time in half using the instant yeast, I would get the same results? I have tried the recipe and the waffles are perfect. Thank you so much. They are chewy and bit crunchy. I stored few in a zip lock bag for two day at room temp. Today i heated it in toaster for approx 60secs. However now the waffles are more chewy and lost its crispiness. is there anyway i can again make it crispy? YAY! I’m glad you loved them as much as I do! What I do is only make what I’m going to eat and freeze or refrigerate the other dough balls, then I can make fresh ones, nice and crisp, when I want another one. The other thing you can do is instead of storing them in a plastic bag store breads in a brown paper bag on the counter for a few days at room temp, it won’t get as soft. When you store your dough balls in the freezer for future use, do you mix the pearl sugar in it already? Thanks! it depends on which stage you freeze them in – I mix in the sugar make balls then freeze before the final rise personally. how much Percentage of fat should the milk have? Whole milk, I believe that’s 4%! Thanks so much! let me know when you try them what you think! This recipe makes 13 waffles and for example, you have fast food restaurant and you would like to make a dough for 130 liege waffles, you should just multiply everything in recipe by 10?..for example instead of 2 eggs, you should use 20 eggs, instead of 1 Tbsp active dry yeast, you should use 10 Tbsp active dry yeast, etc… is everything in this easy way just multiplying ? I’ve never tried making that large of a batch, it’s doubled just fine though. I’d suggest making a regular batch first, to get a feel for the texture and feel. Then I’d try a large batch, cause you’ll be able to see how it’s going and make sure it’s familiar. taking everything x10 should be just fine, BUT…. you never know, good luck! These are the prettiest waffles I ever did see! I’ve never made liege waffles, but it looks like I need to! Thanks a lot for this sicret recipe, it’s amazing. When you have a professional waffle (cast iron) maker. At the end of the day, after making many waffles, how you should clean this cast iron waffle maker?, what is the best way? I’ve seen in pictures and in videos. Mini fast food restaurants (Wafels & Dinges) usually have already made one our before or 30 minutes before a lot of waffles, of course they are already cold, and when the customer comes and orders you a waffle, you should give him/her this already made and cold waffle, or before serving you should Toast your waffle in a waffle maker for several seconds to make it again warm? every waffle truck and restaraunt I’ve been in they’ve had the dough balls made and cold, but they make the waffles fresh, it doesn’t take long to cook the waffles, and it’s the best way to serve it IMO. toasting it would be a totally different experience and as long as your storing something might as well just store the dough, not the waffles. As for cleaning, my stove top one doesn’t have any cords so I honestly soak it (even though your not supposed to wash cast iron). These were intense and awesome! Thanks for the recipe! I just wanted to mention, in case it’s helpful to anyone else, that we have a Cuisinart Griddler with waffle plates. The Griddler lets you set the cooking temperature, which was perfect for these waffles. I told my husband that when I die in a blaze of coronary heart failure glory, it will be because I found this recipe. 😉 So delicious! AWESOME! looking at the griddler RIGHT NOW! I’m so glad you loved the recipe! YUM! These look so good, attractive and appetizing. I love these – and wishing I had at least one if front of me now…but would prefer 10 🙂 I will do it at weekend. Hi I am truly insipred by your recipe as I am planning on opening a waffle shop in another country. do you think I can make a big batch if i just multiply the recipe by the amount I want? or do i need to be cautious with the amount of the yeast or anything else i put in? I used to live in slc and been to Bruge’s waffle shop and really like the cream they serve. any idea on how they made it? it wasn’t a normal whipped cream. I love the cream they use too, I’ve never been able to replicate it, when I ask they say it’s just cream, but clearly their is something else, cause it doesn’t taste just like cream. As for making it larger I’ve never tried a bigger batch, but my suggestion would be to make a regular sized batch a few times so you get used to the texture, then try the larger batch, that way as you make it you can see if maybe you need more or less of something. I would GUESS you could just multiply it and go, but you never know, this is the testing I would do. If you freeze the balls before the 90 min rise then you need to let them thaw and rise, they should get poofy in the same way. IF you freeze extras AFTER they rise then all you’ll need to do is let them thaw, they should already be poofy enough! you’d have to buy a large mixer, larger than the home mixer I use, I have no idea which ones are better than others, I’d find a specialty store and as them. my home size mixer does both with no problem. When you divide the dough do you roll them out or press them to be flatter? All the pictures show large round dough balls in the waffle iron before closing the top. Do you force the waffle iron top down to flatten all of them? This is a firm dough-will that break the waffle iron top if you do it that way? Oh, my! These are delicious. Very sweet, crispy – perfect! Agree that they’re too sweet for breakfast, though. Better as a dessert. However, be prepared to clean a mess – took me about an hour to get all the sugar out of my waffle iron. Worth it. If I wanted to serve this at a restaurant the very last step of proofing the dough, is it crusial? I noticed that Sur La Table and King Arthur Flour now sell a waffle iron brand “Croquade” which shows them making Liege waffles. Wondered if you’d reviewed that one? AMAZING! totally going to check it out! need to review this for SURE! Do these taste similar to the ones sold a Bruge, do you know? also, could i replace cinnamon for vanilla? How much cinnamon would you recommend???? Ive been wanting a recipe like Bruge’s FOREVER! Yes ma’am! That’s what I was going for (my favorite too). I’d leave in the vanilla, it’s a flavor enhancer, and simply add cinnamon, anywhere from 1 tsp to 1 tbsp depending on your preference. I’ve done 2 tsps and liked it but some people like more. well you just sprinkle the remaining flour on top – it keeps the batter from drying out – it get’s mixed in later. When do you add the pearl sugar? step 8. The next day, place the cold dough (it will be quite firm) on a slightly floured surface and knead in ALL the Belgian sugar (a little bit at a time). Once mixed, divide the dough into 13 pieces of equal size. Thank you I must have skimmed over it! I finally got around to making it, and I know you said when you take it out of the fridge it would be quite firm but I think i underestimated how firm it would be. Is it suppose to be hard to knead the sugar in, it took me a while to get it all in? I’m so anxious to try this recipe. On step 7, you said fold the triangle…can you clarify? Can you explain this step over for me? Thanks!! I’m sorry, I don’t see the word triangle in the recipe? I did add a video if that will help? Hi. Look forward to trying the receipe. One question though – i heard if you leave pearl sugar in the dough for a longer time, it melts n the final result is not the same. Your receipe states, it can be added in dough n can be kept in refrigerator for 2 days. Confused? Help!! Ok, so apparently I am 3 years late to the party! But Oh my Gosh are these delicious IMHO. My boyfriend (who is not a sweets guy) thought they were a little too sweet so next time I will try using 3/4 cup pearl sugar. Also I loved all the tips you gave regarding the waffle machine. I have a oster flip Belgian waffle maker, and let me tell you, it worked perfectly. I put it on low and cooked the waffle for 5 minutes (no need to disconnect it) and the waffles were perfect! It didn’t burn the sugar, in fact when I tried disconnecting it for 3 mins as you suggested the pearl sugar didn’t even melt! Ha! Also clean up was a breeze….look at me, I’m sounding like an oster commercial lol. I am excited to try your waffle recipe- but wanted to see if you had any tips on how to know when the waffle iron reaches that 360 degree target temp. You give tips on how long you cooked your waffles on your stovetop but is there a way to know what temperature your waffle iron is cooking at? I have the same stovetop waffle iron but I know my stove cooks extra hot so I’m thinking I might have to cook them on low- but want to know for sure. I made these before with the shortcuts some other blogger suggested and with my other waffle maker. I kept experimenting with settings and times and not sure if I ever figured the best way. The sugar crystals didn’t seem to melt right. Also, like you said, the texture wasn’t quite right with the shortcut way. Thanks! I tend to start at medium and see how long it takes to cook – if it takes longer than 2 mins on each side then I raise the heat a bit – it’s like pancakes the first batch takes some testing – I usually only cook 2 at a time until I feel I have the temp right! I don’t have a stand mixer would a hand one be ok to use? it’s a really thick dough – so it will take a lot of muscle working but I believe it can be done! I’m very late to the party, but very excited to be trying this recipe. A most important question that I’m kind of surprised hasn’t come up yet … the ingredients state 5 cups of bread four but the directions state mix in 1 1/2 cups then after the first rise add the remaining 2 1/2 cups – which total 4 cups of flour vs. the 5 cups in the ingredients. So should we be using 4 or 5 cups of bread flour? Thanks! I think when I changed recipe cards a few months ago it messed up some of the recipes – that’s why it didn’t come up before – yes you are correct and it has been changed, thx! We have a Krups waffle maker (2×2) with adjustable temperature. Using an infrared thermometer I found I could achieve 360F in the middle of the dial range. These waffles are AWESOME! Thank you so much for sharing your recipe Ashlee!!! My only caution to someone trying this recipe for the first time is to use 4 cups of flour per the directions, not the 5 cups called out in the ingredients list. Everything else is spot on!!! One of the greatest things I’ve learned about making THE perfect waffles is separating the eggs. Mix the yolks in with the liquids and beat the whites til they’re stiff~think meringue~ and gently fold them into the batter. 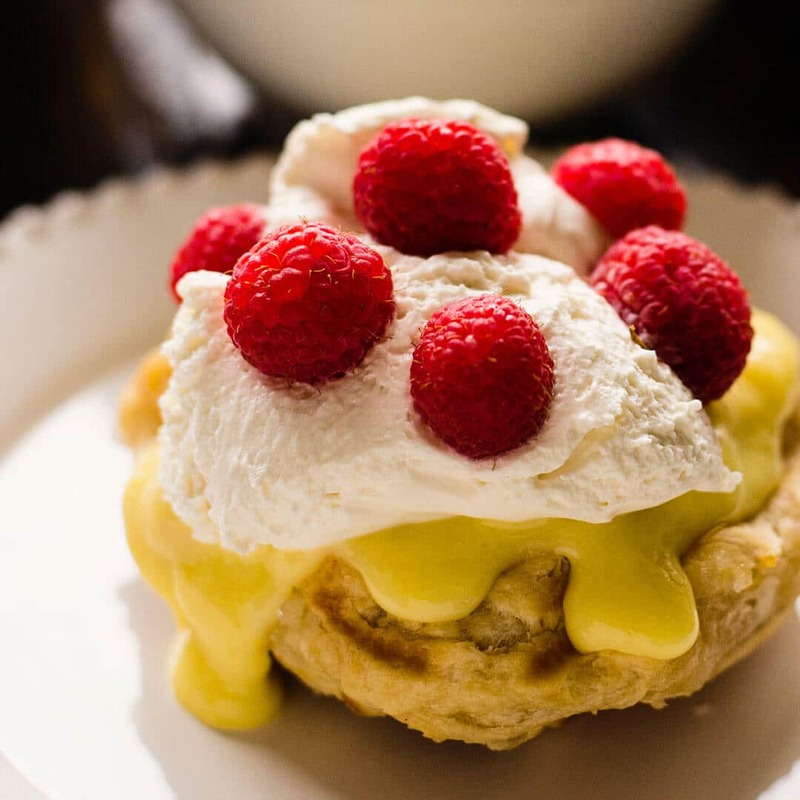 The meringue makes the waffles light and fluffy, even the next day. I super admire and love your recipe. Thank you for sharing!